A decade ago hydroelectricity was the main scale indigenous primary energy resource available in Sri Lanka, taking a share of nearly 45 percent of the total installed capacity. Hydroelectricity in Sri Lanka has been constantly developing since the introduction of the national grid itself, but is currently declining due to the exhaustion of its resource. Currently, ten large hydroelectric power stations are in operation in their optimum. However, it can only suffice to fulfill nearly 38 percent of the present national requirement. In this nature, thermal generation bears almost 47 percent. In early days, petroleum power generation was maintained as an alternative mean of generating electricity in an emergency and it was limited. But due to the various circumstances such as easy maintenance and easy operation, nowadays petroleum generation has become the leading mean of power generation which on the other hand compensates high amount of expenditure. The annual electricity demand rate in Sri Lanka is approximately 8 to 10 percent, with the existing capacity it expected to be doubled in every ten years to sustain in demanding rate and it is a never ending process. After liberating the North and East regions this demand was increased extensively giving a clue that the necessity of immediate and economically workable plan. The power crisis has become a hot topic these days. The experts and politicians are accusing each other for the crisis situation. Though certain issues are highly technical, it is necessary to analyze the data carefully in the proper context to understand the real situation. Under this process all economic development mechanism and industrial production costs have increased. Today, almost one third of humanity in Asia have no lights in the evening which also applicable to Sri Lanka, particularly most of rural areas, which drastically affect in terms of the achieving the desired interest because almost 90 percent of production is depend on the electricity. Present energy saving policies not gives much attention to manage hydropower energy with maximum profitability. Main hydropower plants reach their maximum level. Even though, feasibility is remaining to increase hydropower generation process. Petroleum electricity generation has become a chaotic issue due to rapid increment of the price rate and excessive maintenance. Further coal plantation also cannot seem to be effective to compromise the demands. It is more advisable to search in and give a prominence for environmental friendly sources and renewable energy. However, these methods need huge financial resources to buy power generation sources. The aim of this paper is to critically examine the impact of the hiking fuel price and its implications on to national hydropower supply with viable proposals as sustainable measures. The history of Sri Lankan power supply is going back to many decades. In 1927, the department Government Electrical was established to undertake the initial matters such as generation, transmission. However, the concept of hydro electricity was initiated as the part of the Gal oya projected in 1950s based on as a part of the development plan. The initial demand was 20 Mega Watts. This demand was increased annually compromising the development aspirations of the country. The functions properly regulated with the inception of Ceylon Electricity Board in 1969, entrusting responsibilities such as generation, transmission, and proper distribution where the country was seeking 90 percent of its demand. 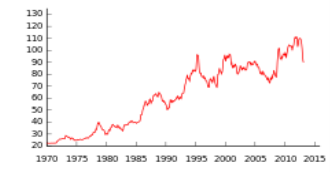 Nevertheless, in 1970s the excessive demand paved the way to import oil as a relying method. That was the first instance where the oil used as a source of power production. However, the new hydro electric capacity of Mahaveli project reduced the importance of oil upbringing the contribution of hydroelectricity. Though it appeared the Mahaveli project as a durable and economic solution to the rapid increment of the Island electricity demand, it was not adequate enough to sustain even though the all power stations were generated their optimum. With that, at early 90s the necessity of oil power generation inclined again unprecedentedly up to its climax. The following two charts clearly indicate the demand against the time as discussed. Hydro electricity is one of the major potential resources since it generates electricity for a low cost rate which is commensurately valuable. Sri Lankan hydro electricity generation has been playing a pivotal role since its inception. Even though these plants generate their optimum, scarcity of hydroelectricity is very much phenomenon. In deep, several facts have been identified as core issues in this field. Early days of grid electricity generation saw hydro as the major component in electricity generation, accounting for more than 90% of the total generation. Recently, this component has been reduced to 35 percent mainly due to the exponential load growth, which cannot be met by this limited resource. Sri Lanka is receiving the rain mainly by two means. Those can be stated as South West and North east monsoons which are highly fallen down to the hilly areas where the power stations are located. But, considering the past two decades as per the statistics of the department of meteorology, the annual rainfalls from these monsoons to the catch man areas has been drastic alternated. Some years it was excessive and over flew and some years it was almost drought throughout the year. Due to this vulnerable fluctuation of the rainfall, it ultimately determined the low generation of hydro electricity. Though the hydro plants are function their optimum, the efficiency of the machineries e has been reduced due to their old conditions and use of out dated technology which directs to low productivity of electricity. Transmission and distribution of electricity over long distance is the other fact. This distorts a large volume of electricity due to heavy resistance without proper insulation which looses a considerable amount from national grid. Considering the past feasibility reports, it has been revealed that the possibility of expanding the reservoirs up to some certain extend in order to increase their capacity which can later substantiate to increase the hydro power generation. But, the government is lacking behind sufficient amount of funds for such major ventures is remaining. Further this is facilitated by improper regulations governing in electricity industry. These are the main problematic facts govern in this field as impediments. With the rapid acceleration of the demand occurred in early 70s, the Ceylon Electricity Board was not in a position to compensate by means of hydro electricity. That was the first occasion where the oil used as a source to generate electricity in national level. In 1986, more than 99 percent of the national requirement was fulfilled by the hydro electricity. However, In early 90s, situation was reverted back to s 1970s in an irreparable manner where the Electricity Board had to divert massively from hydro power into oil generation then the gradual shift was continued subsequent years. The power stations are basically runs on diesel, gas or any other fuel oil. This situation has been slowly but steadily uplifting since then. By year 2000 it can be seen the turning point between these variations and after 2001, the fuel or rather thermal power generation took its forefront and remaining as the leading source than hydro electricity generation. As per the present going of this chain, thermal power is expected to be spearhead the country’s energy generation by 2022. At the latter stage of 2010 the total contribution of the fuel electricity generation was more that 50 percent of the total requirement of the country which bears a huge impact in the field of power generation as well as the economy of Sri Lanka. 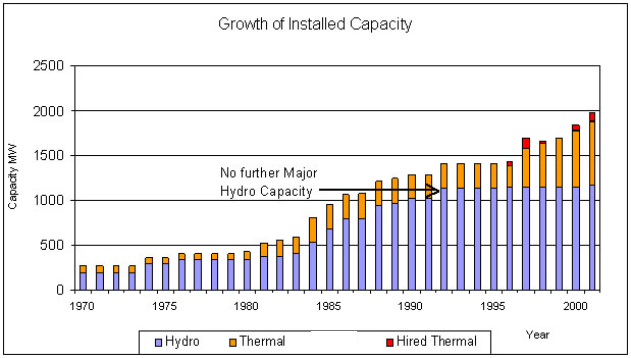 Following chart clearly illustrates the rapid increment of fuel power generation against hydro power generation. Though the fuel source is a one of an effective method of generating electricity there are viable impediments or rather key issues have been identified. Particularly, as a developing country Sri Lanka is undergoing many pivotal difficulties in this aspect due to lack of economic, environmental, technical knowledge, and unsustainable policies. Man discovered oil resources more than 150 year ago and more than 70 percent of deposits have been utilized. Then comparing the annual requirement of the world it can only be sustained for another 2-3 decades. In that context, country like Sri Lanka investing of money for such a short period then would be in vain. Further, considering the annual expenditure, it cost large amount of money to import oil. Further in searching of new resources mainly investing for renewable resources also has bearded a great weight to the economy. Constant fluctuation of the price of a barrel of crude oil in the world market is the next uncontrollable fact of oil. It affect commensurately to the thermal electric generation due to two reasons. 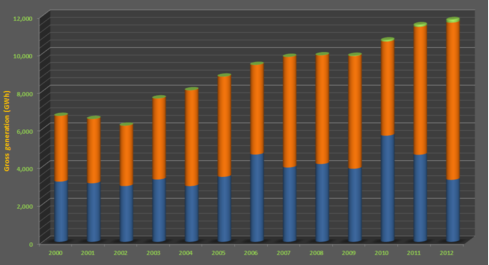 One is the expenditure in purchasing and second is the selling price of a unit. In both aspects it creates a considerable forfeit to the Government. Comparing to the other countries in the Asia Sri Lankan electricity tariff for a unit is significantly high. 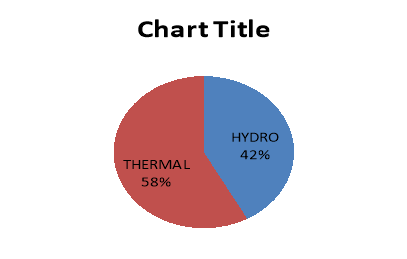 It mainly occurred due to the perpetual variation between the thermal against the hydro as indicated by following chart. Early days the electric supply came through the government monopoly. But in present day majority of thermal power generating agencies in Sri Lanka are private companies. This is another grave mistake made in the electricity supply was setting up of private power plants in mid 1990s on negotiated power purchase agreements. Corrupt officials in the then government forced CEB to sign these agreements with immeasurably unfavorable payment schemes. Some of these agreements signed on the same day, for the same technology, have vastly different tariffs which cannot be negotiated on any government. In this context it has been great pressure to the Government also in compromising with these private companies in purchasing the electricity. Lack of sufficient knowledge to gain the maximum usage of thermal generators is the next impediment. Further lack of knowledge for proper maintenance of these huge generators is another core issue in this subject. Environment issue is one of the sub impacts of petroleum usage. It emits thousands of Gallons of Carbon Dioxide to the air where the environmental pollution is taken place. Coal power provides reasonable cheap rate electricity comparative to the other means of productions. Therefore Sri Lanka established coal power stations in 2011. But, so far it has been giving bitter experiences in this field. It was mainly not setting up timely and lack of supervision of the authorized authorities, lack of foresight in designing as it meets with the sea line environment and use of outdated technology from its initiation. The above mentioned facts are largely govern is this petroleum electricity generation field directly or indirectly. Though it coat highly, these facts have penalized the even function of this field which reduce the effective utilization of this resource subsequently. Considering the above stated facts it is clearly indicated that the present electricity cannot be rely on these two generating means. Also none of these sources cannot be further executed as suit with the future electricity requirement of the Island. Because at present, more that 22 percent of the total population do not have this facility and this daily hiking demand for electricity is a never ending process. In this context, it is highly imperative to search and explore new or renew means to sustain this mechanism. Increase of the volume of electricity by expanding the feasibility of the reservoirs and plants in an economically benefited mean. Further implementing new hydro power generating stations such as Ginganga, Uma oya Brodland are the probable options. This seems to be a costly and time consuming effort at the initial stage. But in terms of considering the oil purchasing expenditure in future these can be identified as profitable measures. Enhancing and promoting mini hydro stations in potential areas is another measure in case of finding a profitable sustainability of hydro electricity. Further it is necessary to minimize the unwanted distortion in transmission and distribution. Methods can be adopted such as placing required step down transformers at identified intervals which enable to transfer a long distance with minimum distortion. Enhancing new sources is the next aspect of generating power. Although these sources are already used to generate power they have not use in a productive manner. Solar power, wind power are the most prominent sources available to this Island. However limited opportunities and technical difficulties are governing to prevent use of such resources in large scale. Further expeditions are continuing for exploring the ability of generating by using sea tides, geothermal energy and crude oil in the Mannar basin. But the facts remaining here are the inability of investing huge amount of money and it does not give a timely answer for these issues. a. Large scale hydro power generation under Government control. b. Mini hydro plants under private sector control and development. c. Revising the present power purchase agreement in a reasonable manner. Uncontrollable but inevitable rapid demand of energy is the next challenge where the sound mechanism is imperative to monitor, analyze and implement to ensure the country wide demand. Achieving the lower, regionally competitive price rate is the next challenge. This is purely due to the fuel mix in electricity generation occurred in early 1980s. Upgrade the power supply quality and service quality including the customer service is the next challenge in this sector. Safety assurance methods and rapid reaction for any breakdown through a proper monitoring system is the vital facets of this. In today context electricity is also can be categorized as one of the basic but essential needs of every country. In order to fulfill the daily requirements in both domestic and industrial purposes, electricity plays a pivotal role. Thermal power generation in fluxed into the field of power generation in in 1970s to overcome the demand as a supplementary source. But at present, it is the leading power generating source in the Island. Though the hydro power generation is generated through the means of water which is meant to be renewable natural resource, many turmoil issues are governing as impediments such as climatic issues, financial issues, technical issues, management issues and policy issues against its enhancement. Initially the Ceylon Electricity Board had the monopoly of power supply. But as to fulfill the excessive demand, it was decided to purchase electricity from private plants which created a dilemma in entire industry now. High rate of tariff, constant hike of the fuel price, technical impotence, lack of coordination between the private and Government sectors, environmental issues and corruption are the core issues affected to reduce the efficiency and sustainability of this sector. Though it assumed the coal power generation as a viable solution, it was failed at its inception and cannot be seen any reliability on that. Therefore it is imperative to identify and carryout economically benefited remedial measures to overcome these issues based on renewable resources, sound management and new explorations. However, these remedies have been constrained due to financial, technical deficiencies and ill management procedures. Further, these issues are resembled as challenges in future. a. It is necessary to rephrase the current policies as it suit to ensure a sound monitoring mechanism and management throughout the field and to ensure a quality service of the field both customers and within the industry. b. As it was previous policies need to be formulated as to maintain the monopoly of all large scale oil and hydro power electricity generation in Government sector and small scale power plants to private sector. c. It is required to minimize the tariff into competitive rate comparing the other countries of the region. The best example is the South Korea. d. Steps have to be taken to promote the sustainable resources by inviting to the countries that are potential with technically and financially. Further, positive renewable sources like wind and solar energy have to be uplifted to utilize in a large scale. e. Hiking of fuel price is a never ending process when consider its scarcity. Therefore it is frivolous to depend on this resource in long term process as a country. Any investments or policies in related to this aspect have to be initiated based on that perceptive. "Effects of Fuel Prices of National Power Supply." UKEssays.com. 11 2018. All Answers Ltd. 04 2019 <https://www.ukessays.com/essays/economics/effects-fuel-prices-national-power-7829.php?vref=1>. "Effects of Fuel Prices of National Power Supply." All Answers Ltd. ukessays.com, November 2018. Web. 20 April 2019. <https://www.ukessays.com/essays/economics/effects-fuel-prices-national-power-7829.php?vref=1>. UKEssays. November 2018. Effects of Fuel Prices of National Power Supply. [online]. Available from: https://www.ukessays.com/essays/economics/effects-fuel-prices-national-power-7829.php?vref=1 [Accessed 20 April 2019]. UKEssays. Effects of Fuel Prices of National Power Supply [Internet]. November 2018. [Accessed 20 April 2019]; Available from: https://www.ukessays.com/essays/economics/effects-fuel-prices-national-power-7829.php?vref=1.